All pictures courtesy of Graham Barron. The last of the Santa Specials ran on Sunday 17th December 2017. The unit used was a hybrid of our 2 regular DMUs. The Dufftown car Driver Motor Brake Standard from Spirit of Speyside was coupled to the Keith Town car Driver Motor Composite of Spirit of Banffshire for operational reasons. The following are a selection of photos taken on the final Santa Specials of 2017. Both photos taken at Keith Town Station. Left photo shows the Dufftown end with its Spirit of Speyside name. Note the elf on the platform. Right photo shows the Keith Town end with its Spirit of Banffshire name. Note also the seasonal sprinkling of snow on the platform. These photos give a peek into Santa’s workshop with presents waiting for the boys and girls. Left photo the booking on point at Keith Town Station, the Chief Elf has stepped out for a moment to see if any passengers have arrived yet. 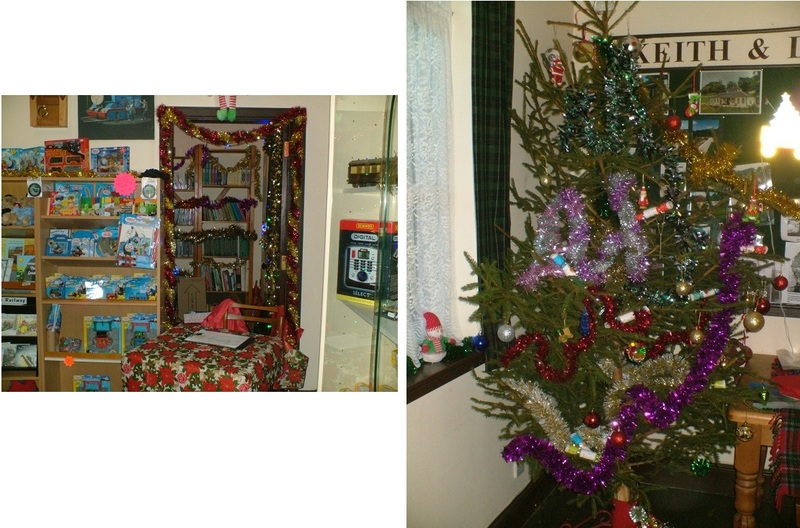 Right photo the Christmas tree at Keith Town Station. The 2nd Rainbows Keith have arrived at the North Pole and pose for photos! Santa just visible in right background. Santa at the North Pole with some excited boys and girls. Some final scenes at the North Pole as the light begins to fade. This will be my last update of the KDRA web. I have maintained the web for the past 11+ years including overseeing the implementation of the new web site in 2017. I felt it was time for me to step down and hand over to a fresh Webmaster. I have enjoyed my time as Webmaster and hope that I have entertained and enlightened you regarding the KDR activities. The rest of my activities with the KDR as driver, 2nd man, guard and wherever else a pair of hands is needed will continue so we may meet again, do say hello.